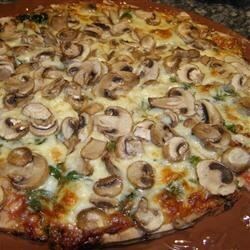 "A simple mushroom spinach pizza, much better then takeout pizza!" Preheat oven to 350 degrees F (175 degrees C). Place pizza crust on baking sheet. In a small bowl, mix together olive oil and sesame oil. Brush onto pre-baked pizza crust, covering entire surface. Stack the spinach leaves, then cut lengthwise into 1/2 inch strips; scatter evenly over crust. Cover pizza with shredded mozzarella, and top with sliced mushrooms. Bake in preheated oven for 8 to 10 minutes, or until cheese is melted and edges are crisp. Excellent pizza!! We eat it at least once a week sometimes twice. I will occasionally grate some feta on top of the mozzarella however, the original recipe needs no improvement. Thanks!! A nice combination of flavors, but go lightly on the sesame oil. It's really strong! Easy and tasty...what more could you want? Using english muffins and sauteed spinach makes a nice variation. Very good. I sauteed the mushrooms with fresh, pressed garlic before adding to pizza. I like this so much better than tomato sauce pizza. Thank you! FANTASTIC! And, if you add tomatoes--even better. Wonderful flavor, and faster, fresher and better tasting than delivery pizza. This is a really easy to make and tasty pizza!